Italian niche line Bruno Acampora will launch Azzurro di Capri, a new fragrance. The Summer sky, a song from Adriano Celentano and one of the most passionate fashion collections designed by Walter Albini. 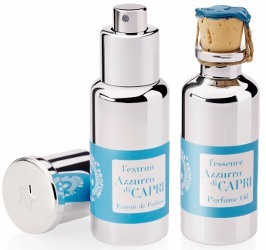 Azzurro di Capri is the newest Essence from Acampora, a tribute to Summer and to the Island of Capri. Pervasive yet delicate citrus notes from the coast of Amalfi melt with the blossom of mediterranean jasmin, all to develop into warm summer winds carrying Patchouli, Amber and musky notes. Freshness and pureness, but also passion and skilled craftsmanship from Southern Italy, the distinguishing elements to all Acampora's fragrances. Bruno Acampora Azzurro di Capri will be available in 20 ml Perfume Oil or 30 ml Extrait.